Generally the ductility of cast iron is very low, and it cannot be rolled, drawn or worked at room temperature. However, they melt readily and can be cast into complicated shapes which are usually machined to final dimensions. They are known as cast irons because casting is the only suitable process applied to these alloys. Though the common cast irons are brittle and have lower strength, they can be cast more readily than steels and are cheap. “Cast iron is brittle.” is an outdated but widely held truism which mistakenly implies that all cast irons are the same, and none are ductile. In fact, they can be made ductile. Malleable cast iron made from white cast iron and nodular iron are ductile. Ductile iron offers the design engineer a unique combination of a wide range of high strength, wear resistance, fatigue resistance, toughness and ductility in addition to the well-known advantages of cast iron – castability, machinability, damping properties, and economy of production. Unfortunately, these positive attributes of ductile iron are not as widely known as the mistaken impression of brittleness is well known. Information about various types of cast iron is given in this article. The best method of classifying cast iron is according to metallographic structure. There are four variables as under to be considered which lead to the different types of cast irons. The heat treatment after casting. Above variables control the condition of the carbon and also its physical form. The carbon may be combined as iron carbide in cementite, or it may exist as free carbon in graphite. The shape and distribution of the free carbon particles will greatly influence the physical properties of the cast iron. Various types of cast irons are as under. In this type of cast irons, all the carbon is in the combined form as cementite. In this type of cast irons, most or all of the carbon is uncombined in the form of irregular round particles known as temper carbon. This is obtained by heat treatment of white cast iron. In this type of cast irons, most or all of the carbon is uncombined in the form of graphite flakes. In this type of cast irons, a white cast iron layer at the surface is combined with a grey cast iron interior. By special alloy additions, in this type of cast irons, the carbon is largely uncombined in the form of compact spheroids. This structure differs from malleable iron in that it is obtained directly from solidification and the round carbon particles are more regular in shape. In this type of cast irons, the properties or the structure of any of the above types are modified by the addition of alloying elements. Detail information on above cast irons is given below. 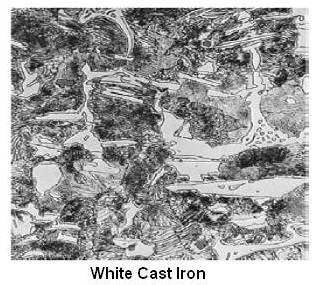 All white cast irons are hypoeutectic alloys. Their typical microstructure on fast cooling from the liquid state consists of dendrites of transformed austenite (pearlite) in a white interdendritic network of cementite. Since white cast iron contains a relatively large amount of cementite as a continuous interdendritic network, it makes it hard and wear resistant but extremely brittle and difficult to machine. Completely white cast irons are limited in engineering applications due to this brittleness and lack of machinability. They are used where resistance to wear is most important and the service does not require ductility, such as liners for cement mixer and extrusion nozzles. A large quantity of white cast iron is used as a starting material for the manufacture of malleable cast iron. The range of mechanical properties for unalloyed white cast iron is as under. Cementite (iron carbide) is a metastable phase. There is a tendency for cementite to decompose into iron and carbon, but under normal conditions it tends to persist indefinitely in its original form. This tendency to form free carbon is the basis for the manufacture of malleable cast iron. Decomposition of cementite into iron and carbon is favored by elevated temperature, the existence of solid nonmetallic impurities, higher carbon contents and the presence of elements that aid the decomposition of cementite. The purpose of malleabilization is to convert all the combined carbon in white iron into irregular nodules of temper carbon (graphite) and ferrite. Commercially, this process is carried out in two steps known as the first and second stages of the anneal. White irons suitable for conversion to malleable iron are of the following range of composition. In the first stage of annealing, the white iron casting is slowly reheated to a temperature between 1650 and 1750Â°F. They are held at this temperature until all massive carbides have been decomposed. Since graphitization is a relatively slow process, the casting must be soaked at temperature for at least 20 hours and large loads may require as much as 72 hours. The structure at completion of first stage graphitization consists of temper carbon nodules distributed throughout the matrix of saturated austenite. After first stage of annealing, castings are cooled as rapidly as practical to about 1400Â°F in preparation for the second stage of the annealing heat treatment. The fast cooling cycle usually requires 2 to 6 hours depending on the equipment used. In the second stage annealing, the castings are cooled slowly at a rate of 5 to 15Â°F/h through the critical range at which the eutectoid reaction will take place. During the slow cooling, the carbon dissolved in the austenite is converted to graphite on the existing temper carbon particles, and the remaining austenite transforms to ferrite. Once graphitization is complete, no further structural changes take place during cooling to room temperature, and the structure consists of temper carbon nodules in a ferrite matrix. This type is known as standard or ferritic malleable iron. In the form of compact nodules, the temper carbon does not break up the continuity of the tough ferritic matrix. This results in a higher strength and ductility than exhibited by gray cast iron. The graphite nodules also serve to lubricate cutting tools, which account for the very high machinability of malleable iron. Ferritic malleable iron has been widely used for automotive, agricultural and railroad equipment, railing casting on bridges, chain hoist assemblies, pipe fittings and many applications in general hardware. Alloyed malleable irons are those whose properties result from the addition of alloying elements. Since alloyed malleable irons are completely malleableized, their influence is largely on the ferritic matrix. Two principal kinds are copper alloyed and copper-molybdenum alloyed malleable iron. The effect of copper is to increase corrosion resistance, tensile strength and yield point at very slight reduction in ductility. Hardness is also increased. The addition of copper and molybdenum in combination produces a malleable iron of superior corrosion resistance and mechanical properties. The strength and hardness of pearlitic malleable iron is more than ferritic malleable iron. In this type of iron, the structure consists of temper carbon nodules in a pearlite matrix. 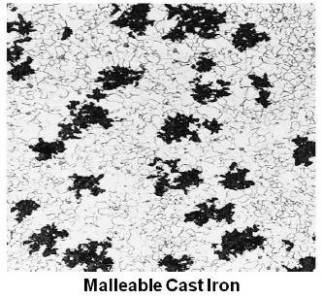 For making pearlitic malleable iron, a controlled quantity of carbon, in the order of 0.3 to 0.9 percent is retained as finely distributed iron carbide during first stage of annealing. If manganese is added, the regular cycle (of second annealing) can be maintained to retain combined carbon throughout the matrix, or the second stage annealing of the normal process be replaced by a quench, usually air, which cools the castings through the eutectoid range fast enough to retain combined carbon throughout the matrix. The amount of pearlite formed depends upon the temperature at which the quench starts and the rate of cooling. If the air quench produces a fast enough cooling rate through the eutectoid range, the matrix will be completely pearlitic. It is a common practice to temper most pearlitic malleable iron after air cooling to spheroidize the pearlite, lower hardness, and improve machinability and toughness. Pearlitic malleable irons are used for axle and differential housings, camshafts and crankshafts in automobiles, gears, elevator buckets in conveyor equipment, pumps, nozzles, hammers, etc. For comparison, tensile properties of different types of malleable iron are given in the following table. Cast irons are alloys of iron, carbon, and silicon in which more carbon is present than can be retained in solid solution in austenite at the eutectic temperature. In gray cast iron, the carbon that exceeds the solubility in austenite precipitates as flake graphite. Gray irons usually contain 2.5 to 4% C, 1 to 3% Si, and additions of manganese, depending on the desired microstructure (as low as 0.1% Mn in ferritic gray irons and as high as 1.2% in pearlitics). Sulphur and phosphorus are also present in small amounts as residual impurities. Gray cast iron is by far the oldest and most common form of cast iron. As a result, it is assumed by many to be the only form of cast iron and the terms “cast iron” and “gray iron” are used interchangeably. Unfortunately the only commonly known property of gray iron – brittleness – is also assigned to “cast iron” and hence to all cast irons. Gray iron is named so because its fracture has a gray appearance. It contains carbon in the form of flake graphite in a matrix which consists of ferrite, pearlite or a mixture of the two. In the manufacture of gray cast irons, the tendency of cementite to separate into graphite (graphitization) and austenite or ferrite/pearlite is aided by high carbon content and the proper amount of graphitizing elements, notably silicon. With proper control, the alloy will form austenite and graphite at the eutectic temperature (of the stable iron-graphite equilibrium diagram) of 2075Â°F. At any rate, any cementite which is formed will graphitize rapidly. The graphite appears as many irregular, generally elongated and curved plates which give gray cast iron its characteristic grayish or blackish fracture. The strength of gray cast iron depends almost entirely on the matrix in which the graphite is embedded. This matrix is largely determined by the condition of the eutectoid cementite. If the composition and cooling rate are such that the eutectoid cementite also graphitizes, then the matrix will be entirely ferritic. On the other hand, if graphitization of the eutectoid cementite is prevented, the matrix will be entirely pearlitic. The constitution of the matrix may be varied from pearlitic, through mixture of pearlitic and ferritic in different proportions, down to practically pure ferritic. Moderate cooling rate results in a pearlitic gray iron where as slow cooling rate results in a ferritic gray iron. The graphite-ferrite mixture is the softest and weakest gray iron. The strength and hardness increases with the increase in combined carbon, reaching a maximum with the pearlitic gray iron. Silicon is very important element in the metallurgy of gray iron. It is a graphitizer and also increases fluidity. Therefore, during solidification in the presence of silicon, carbon is precipitated as primary graphite in the form of flakes. Once primary graphite has formed, its shape cannot be altered by any method. 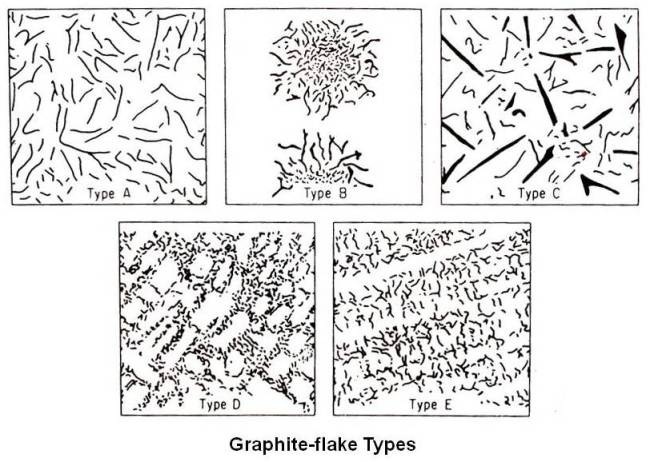 It is these weak graphite flakes that break up the continuity of the matrix and the notch effect at the end of these flakes that accounts for the low strength and low ductility of gray iron. 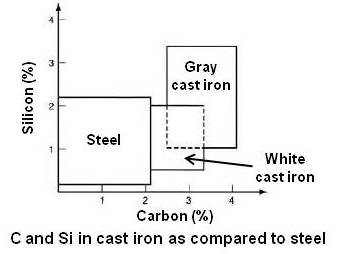 Following figure shows percentage of carbon and silicon in cast irons and steels. Stress relieving is probably the most frequently applied heat treatment for gray irons. 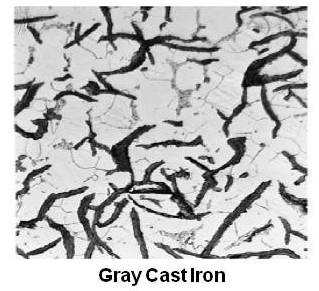 Gray iron in the as-cast condition usually contains residual stresses because cooling proceeds at different rates throughout various sections of a casting. The resultant residual stresses may reduce strength, cause distortion, and in some cases even result in cracking. Annealing of gray iron improves its machinability. Gray iron is normalized to enhance its mechanical properties, such as hardness and tensile strength, or to restore as-cast properties that have been modified by another heat treating process, such as preheating and post heating associated with repair welding. Gray iron, like steel, can be hardened and tempered. The high matrix hardness and graphite as lubricant results in a surface with good wear resistance for some applications such as farm implement gears, sprockets, diesel cylinder liners, etc. Thus, heat treatment extends the field of application of gray iron as an engineering material. Large graphite flakes seriously interrupt the continuity of pearlitic matrix, thereby reducing the strength and ductility of gray iron. Small graphite flakes are less damaging and are therefore generally preferred. Graphite-flak sizes are usually determined by comparison with standard sizes prepared jointly by the AFS (American Foundrymenâ€™s Society) and the ASTM (American Society for Testing Materials). The procedure for preparation and measurement of flake size is given in ASTM standards specification A247. The measurement is made of the lengths of the largest graphite flakes in an unetched section of the gray iron at 100x. Numbers are assigned as indicated in the table given below. The way in which the graphite lakes are arranged in the microstructure of gray iron is usually indicated as one or more types that have been jointly prepared by the AFS and the ASTM. The five flake types are as under. The most important classification of gray cast iron is given in the ASTM Specification A48. The gray iron castings are classed in seven classes (Nos. 20, 25, 30, 35, 40, 50 and 60) which give the minimum tensile strength of test bars in thousands of pounds per square inch. For example, class 20 gray iron would have a minimum tensile strength of 20000 psi. Gray irons do not exhibit a well defined yield point as do mild steels. The percent elongation is small for all cast irons, rarely exceeding 3 to 4 percent, and the reduction of area is too small to be appreciable. Many grades of gray iron have higher torsional shear strength than some grades of steel. This characteristic, along with low notch sensitivity, makes gray iron a suitable material for various types of shafting. The fluidity of liquid gray iron, and its expansion during solidification due to the formation of graphite, has made this metal ideal for the economical production of shrinkage-free, intricate castings. Because gray iron is the least expensive type of casting, it should always be considered first when a cast metal is being selected. Another metal should be chosen only when the mechanical and physical properties of gray iron are inadequate. Chilled-iron castings are made by casting the molten metal against a metal chiller, resulting in a surface of white cast iron. This hard, abrasion-resistant white-iron surface or case is backed up by a softer gray iron core. This case-core structure is obtained by careful control of the overall alloy composition and adjustment of the cooling rate. Freezing starts first, and cooling rate is most rapid where the molten metal is in contact with the mold walls. The cooling rate decreases as the center of the casting is approached. If only selected surfaces are to be white iron, it is common practice to use a composition which would normally solidify as gray iron and employ metal liner (chills) to accelerate the cooling rate of the selected areas. The depth of the white iron layer is controlled by using thin metal plates whenever a thin white iron layer is desired and heavier metal plates where a deeper chill is necessary. Chilled iron casting is used for railway-car wheels, crushing rolls, sprockets, and many other heavy-duty machinery parts. Nodular cast iron, also known as ductile iron (in UAS), spheroidal graphite iron (in UK and Europe) and spherulitic iron is cast iron in which the graphite is present as tiny balls or spheroids. The compact spheroids interrupt the continuity of the matrix much less than graphite flakes, resulting in higher strength and toughness compared with a similar structure of gray cast iron. Nodular cast iron differs from malleable iron in that it is usually obtained as a result of solidification and does not require heat treatment. The spheroids are more rounded than the irregular aggregates of temper carbon found in malleable iron. 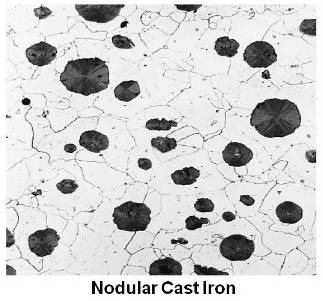 The total carbon content of nodular iron is the same as in gray iron. Spheroidal graphite particles form during solidification because of the presence of a small amount of certain alloying elements. The nodule forming addition, usually magnesium or cerium is made to the ladle just before casting. Since these elements have a strong affinity for sulfur, in the base iron-alloy, sulfur content must be below 0.015 percent for the treatment to be effective, and the alloys are described as desulfurized. ASTM A536 – Standard Specification for Ductile Iron Castings is the most frequently used specification, covering the general engineering grades of ductile iron. Standard specifications for ductile iron are normally based on mechanical properties, except for those defining austenitic ductile iron, which are based on composition. Mechanical requirements for various grades of ductile irons as per ASTM A536 are as under. The amount of ferrite in the as-cast matrix depends on composition and rate of cooling. Nodular iron with a matrix having a maximum of 10 percent pearlite is known as ferritic irons. This structure gives maximum ductility, toughness and machinability. A matrix structure which is largely pearlitic can be produced as cast or by normalizing. Pearlitic ductile irons are stronger but less ductile than ferritic iron. A martensitic matrix may be obtained by quenching in oil or water. The quenched structures are usually tempered after hardening to desired strength and hardness. Austenitic ductile irons are highly alloyed types which retain their austenitic structure down to at least minus 75Â°F. They have relatively high corrosion resistance and good creep properties at elevated temperatures. More information of them is given in this article under alloy cast irons. Tensile mechanical properties of basic types of nodular iron are given in the following table. Nodular iron is used in agricultural – tractor and implement parts, automotive and diesel â€“ crankshafts, pistons and cylinder heads, electrical fittings, motor frames, circuit breaker parts, Mining â€“ hoist drums, drive pulleys, flywheels and elevator buckets, steel mills, tools and dies. An alloy cast iron is one which contains a specially added element or elements in sufficient amount to produce a measurable modification in the physical or mechanical properties. Alloying elements are added to cast iron for special properties such as resistance to corrosion, heat or wear and to improve mechanical properties. The most common alloying elements are nickel, chromium, molybdenum and copper. For various industrial applications requiring resistance against wear, corrosion and heat, two types of alloy cast irons, High-alloy white cast irons and Ni-Resist cast irons are widely used. Information about both these varieties is given in the sections that follow. The high-alloy white irons are primarily used for abrasion-resistant applications. The chromium content of high-alloy white irons also enhances their corrosion-resistant properties. The large volume fraction of primary and/or eutectic carbides in their microstructures provides the high hardness needed for crushing and grinding other materials. The metallic matrix supporting the carbide phase in these irons can be adjusted by alloy content and heat treatment to develop the proper balance between the resistance to abrasion and the toughness needed to withstand repeated impact. While low-alloy white iron castings, which have alloy content below 4%, develop hardness in the range of 350 to 550 HB, the high-alloy irons range in hardness from 450 to 800 HB. Specification ASTM A532 covers the composition and hardness of the abrasion-resistant white iron grades. This specification deals with abrasion-resistant cast irons used for mining, milling, earth-handling, and manufacturing industries. It may be noted that simple and low-alloy white cast irons that consist essentially of iron carbides and pearlite are specifically excluded from this specification. They are low-chromium alloys containing 3 to 5% Ni and 1 to 4% Cr, with one alloy modification that contains 7 to 11% Cr. The nickel-chromium irons are also commonly identified as Ni-Hard types 1 to 4. They contain 11 to 23% Cr, up to 3.5% Mo and often additionally alloyed with nickel or copper. A third group comprises the 25% or 28% Cr white irons, which may contain other alloying additions of molybdenum and/or nickel up to 1.5%. The chemical composition for various class and type of high-alloy white irons as per ASTM A532 in % is as under. In these martensitic white irons, nickel is the primary alloying element because at levels of 3 to 5% it is effective in suppressing the transformation of the austenite matrix to pearlite, thus ensuring that a hard martensitic structure (usually containing significant amounts of retained austenite) will develop upon cooling in the mold. Chromium is included in these alloys, at levels from 1.4 to 4%, to ensure that the irons solidify carbidic, that is, to counteract the graphitizing effect of nickel. These types of white irons are used for crushing and grinding applications. The optimum composition of a nickel-chromium white iron alloy depends on the properties required for the service conditions and the dimensions and weight of the casting. Abrasion resistance is generally a function of the bulk hardness and the volume of carbide in the microstructure. When abrasion resistance is the principal requirement and resistance to impact loading is secondary, alloys having high carbon contents, ASTM A532 class I type A (Ni-Hard 1), are recommended. When conditions of repeated impact are anticipated, the lower carbon alloys, ASTM A532 class I type B (Ni-Hard 2) are recommended because they have less carbide and, therefore, greater toughness. A special grade, class I type C, has been developed for producing grinding balls and slugs. Here, the nickel-chromium alloy composition has been adapted for chill casting and specialized sand casting processes. The ASTM A532 Class I type D (Ni-Hard 4) alloy is a modified nickel-chromium iron that contains higher levels of chromium, ranging from 7 to 11%, and increased levels of nickel, ranging from 5 to 7%. Carbon is varied according to the properties needed for the intended service. Carbon contents in the range of 3.2 to 3.6% are prescribed when maximum abrasion resistance is desired. When impact loading is expected, carbon content should be held in the range of 2.7 to 3.2%. Nickel content increases with section size or cooling time of the casting to inhibit pearlitic transformation. For castings of 38 to 50 mm thick, 3.4 to 4.2% Ni is sufficient to suppress pearlite formation upon mold cooling. Heavier sections may require nickel levels up to 5.5% to avoid the formation of pearlite. It is important to limit nickel content to the level needed for control of pearlite; excess nickel increases the amount of retained austenite and lowers hardness. Silicon is needed for two reasons. A minimum amount of silicon is necessary to improve fluidity of the melt and to produce a fluid slag, but of equal importance is its effect on as-cast hardness. Increased levels of silicon, in the range of 1 to 1.5%, have been found to increase the amount of martensite and the resulting hardness. It is important to note that higher silicon contents can promote pearlite and may increase the nickel requirement. Chromium is primarily added to offset the graphitizing effects of nickel and silicon in types A, B, and C alloys, ranges from 1.4 to 3.5%. Chromium content must be increased with increasing section size. In type D alloy, chromium levels range from 7 to 11% (typically 9%) for the purpose of producing eutectic carbides of the M7C3 chromium carbide type, which are harder and less deleterious to toughness. Manganese is typically held to a maximum of 0.8% even though 1.3% maximum is allowed according to ASTM A532 specification. While it provides increased hardenability to avoid pearlite formation, it is a more potent austenite stabilizer than nickel, and promotes increased amounts of retained austenite and lower as-cast hardness. For this reason, higher manganese levels are undesirable. When considering the nickel content required to avoid pearlite in a given casting, the level of manganese present should be a factor. Copper increases both hardenability and the retention of austenite and therefore must be controlled for the same reason that manganese must be limited. Copper should be treated as a nickel substitute and, when properly included in the calculation of the amount of nickel required to inhibit pearlite, it reduces the nickel requirement. Molybdenum is a potent hardenability agent in these alloys and is used in heavy-section castings to augment hardenability and inhibit pearlite. The high-chromium white irons have excellent abrasion resistance and are used effectively in slurry pumps, coal-grinding mills, shot-blasting equipment, and components for quarrying, hard-rock mining, and milling. In some applications they must also be able to withstand heavy impact loading. These alloyed white irons are recognized as providing the best combination of toughness and abrasion resistance attainable among the white cast irons. In the high-chromium irons, as with most abrasion-resistant materials, there is a trade-off between wear resistance and toughness. By varying composition and heat treatment, these properties can be adjusted to meet the needs of most abrasive applications. Specification ASTM A532 covers the compositions and hardnesses of two general classes of the high-chromium irons. The chromium-molybdenum irons (Class II of ASTM A532) contain 11 to 23% Cr and up to 3.5% Mo and can be supplied either as-cast with an austenitic or austenitic-martensitic matrix, or heat-treated with a martensitic matrix microstructure for maximum abrasion resistance and toughness. They are usually considered the hardest of all grades of white cast irons. Compared to the lower-alloy nickel-chromium white irons, the eutectic carbides are harder and can be heat-treated to achieve castings of higher hardness. Molybdenum, as well as nickel and copper when needed, is added to prevent pearlite and to ensure maximum hardness. The high-chromium irons (class III of ASTM A532) represent the oldest grade of high-chromium irons. These general-purpose irons, also called 25% Cr and 28% Cr irons, contain 23 to 28% Cr with up to 1.5% Mo. To prevent pearlite and attain maximum hardness, molybdenum is added in all but the lightest-cast sections. Alloying with nickel and copper up to 1% is also practiced. Although the maximum attainable hardness is not as high as in the class II chromium-molybdenum white irons, these alloys are selected when resistance to corrosion is also desired. Austenitic gray iron castings known as Ni-Resist irons (also called standard Ni-Resist irons) and austenitic ductile iron castings known as ductile Ni-Resist irons are used primarily for their resistance to heat, corrosion, and wear. Both families of alloys have similar general characteristics as described below. They have been specified to solve corrosion problems involving the handling of sour well oils, salts, salt water, acids and alkalies. They are intermediate in corrosion resistance between gray cast irons and austenitic chromium-nickel stainless steels. The excellent erosion-corrosion resistance of the Ni-Resist alloys has resulted in extensive applications for pump and valve components in sea water handling systems. Engine, pump and their parts like pistons, wearing rings, sleeves, glands, etc. and other metal-to-metal rubbing parts have been cast in the Ni-Resist alloys. Slurries, wet steam and gases with entrained particles are among the elements extremely erosive to most metals. The Ni-Resist alloys offer a combination of corrosion-erosion-resistant properties that provide superior service under many erosive conditions. Ni-Resist castings are considerably superior to gray iron under these service conditions. Expansivities from 2.2 to 10.6 x 10-6 in./in. per degree F are available with different types of Ni-Resist irons. This affords a conventional cast metal with low expansivity for precision machines or parts. For unusual high-temperature service, 1600Â°F and above, the ductile grade of Ni-Resist should be considered. The standard grades (Ni-Resist irons) exhibit a high order of heat resistance to 1300Â°F. The alloys have a relatively low rate of oxidation, and what oxidation does occur adheres tenaciously to the base metal. This property is especially helpful in gas turbine, manifold and turbocharger applications. The Castability of Ni-Resist permits casting complicated and intricate designs often difficult to produce with some other high-alloy cast metals. Both the castability and machinability of the Ni-Resist alloys aid in producing finished parts economically. Basically, the family is a series of cast irons to which has been added sufficient nickel to produce an austenitic structure similar to that of austenitic stainless steel. Austenitic gray iron is characterized by uniformly distributed graphite flakes, some carbides, and an austenitic structure. This structure provides the alloy familyâ€™s heat and corrosion resistant properties. The several types of Ni-Resist are produced by varying the nickel content and, to some extent, the chromium content and are covered by ASTM A436 – Standard Specification for Austenitic Gray Iron Castings. The types of castings covered are Type 1, Type 1b, Type 2, Type 2b, Type 3, Type 4, Type 5, and Type 6. Their chemical composition in % is as under. Mechanical requirements for various types of Ni-Resist irons covered by ASTM A436 are as under. Characteristics and applications of the different types are as under. Types 1 and 2: are used interchangeably in many corrosion and wear resistant applications. Both are specially suited to heavy metal-to-metal wear service. Type 1: has some advantages over the other types in handling mineral-acid corrosives and salt water. Type 1b: has superior corrosion-erosion resistance in comparison with Type 1, and is harder and stronger. Type 2: because of its wide use in corrosive environments, is the most commonly used. It is preferred for heat and oxidation resistance to 1300Â°F and in steam service. It is also used for handling caustics, alkalies, ammoniacal solutions, food products, rayon, plastics and similar environments where freedom from copper contamination is desired. Type 2b: is especially recommended for heat applications up to 1500Â°F. Uses include gas turbine parts, exhaust manifolds and turbochargers. If machining is required, the chromium level should be kept between 3.0 and 4.0 percent. The greater hardness of Type 2b makes it suitable for resistance to abrasive wear with corrosion, but is not suited for metal-to-metal wear. Type 3: is recommended for sever thermal shock service between room temperature and 450Â°F. At temperatures between 450 and 1500Â°F it can be used without severe thermal shock. It may be used for diesel exhaust manifolds and turbochargers. The type offers high resistance to erosion in wet steam and corrosive slurries. Type 4: is recommended where strain-resistance is required. This type is superior to other types in resistance to erosion, corrosion and oxidation. Type 5: offers minimum thermal expansivity which provides dimensional stability for machine tool parts, forming dies, steam turbines, scientific instruments and expansion joints. The ductile Ni-Resist irons are similar to standard/conventional Ni-Resist compositions but have been treated with magnesium to convert the graphite from the flake form to spheroids, which results in higher strength and ductility. Austenitic ductile iron, also known as austenitic nodular iron or austenitic spheroidal iron, is characterized by having its graphite substantially in a spheroidal form and substantially free of flake graphite. It contains some carbides and sufficient alloy content to produce an austenitic structure. The ductile family of Ni-Resist is available in every type except Type 1, which because of the higher copper content does not respond properly to the magnesium treatment. There are in addition several modifications of Type 2 to 5. Various types of ductile Ni-Resist irons are covered by ASTM A439 – Standard Specification for Austenitic Ductile Iron Castings. Their chemical composition in % is as under. Mechanical requirements for various types of ductile Ni-Resist irons covered by ASTM A439 are as under. Type D-2: is recommended for service requiring resistance to corrosion, erosion, frictional wear and temperature up to 1400Â°F. This type also has high thermal expansivity. Type D-2B: is recommended for superior resistance to neutral and reducing salts, and where higher resistance to erosion and oxidation than that offered by Type D-2 is desired. Type D-2C: is recommended where resistance to heat and corrosion is less severe and where high ductility is desired. Type D-3: is recommended for thermal shock service and where the thermal expansivity should match that of ferritic stainless steels. This type, in addition to having excellent elevated-temperature properties, also offers high resistance to erosion. Type D-3A: is recommended for use where a high degree of wear and galling resistance is required along with intermediate thermal expansion. Type D-4: is superior to Types D-2 or D-3 in resistance to corrosion, erosion and oxidation. Type D-5: is utilized whenever minimum thermal expansion is desired. It may also be preferred over other types of Ni-Resist to reduce thermal stress. Type D-5B: is recommended for applications requiring a very low order thermal stress. In addition, this type has a high level of heat and oxidation resistance as well as good mechanical properties at elevated temperatures. Type D-5S: is recommended where oxidation resistance in air to 1800Â°F is desired. It also resists embrittlement and offers thermal stability and strength in cyclic heating to 1600Â°F. 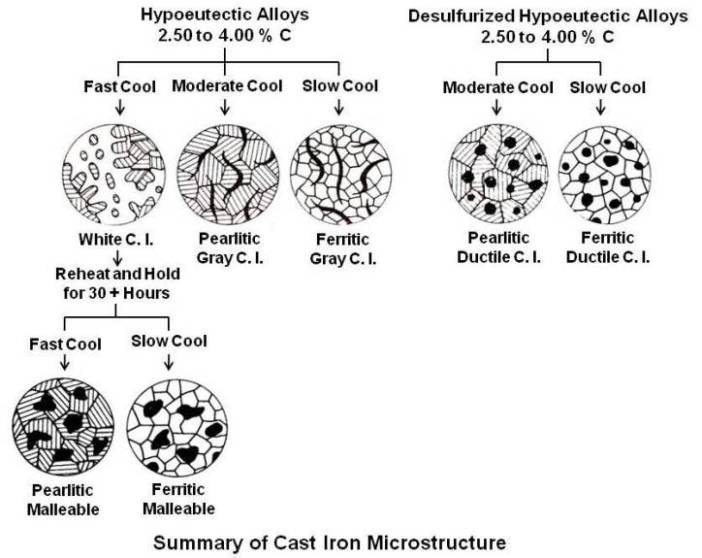 A summary of the cooling rates to make various types of cast iron and their microstructure at room temperature is given below.